Should Freedomites support either Workers or Labourites or their party at the next general elections? He's the man they once saw as a future messiah who would free them from the shackles of virtual irrelevance and return them to prominence. He's the one they once envisaged as the redeemer who would raise them from the dead and breathe new life into them again. He's the person they once identified as the saviour-in-waiting destined to lead them back to the promise land of government. However, having failed to secure him as their deliverer, having watched as he became the Labour Party's miracle worker, all they want these days is his back. "We the (Dominica) Freedom Party, we want to (see) the back of Roosevelt Skerrit," said Michael Astaphan, the DFP's interim political leader. The DFP has experienced a dramatic decline since its defeat by the United Workers Party (UWP) in the 1995 general election. 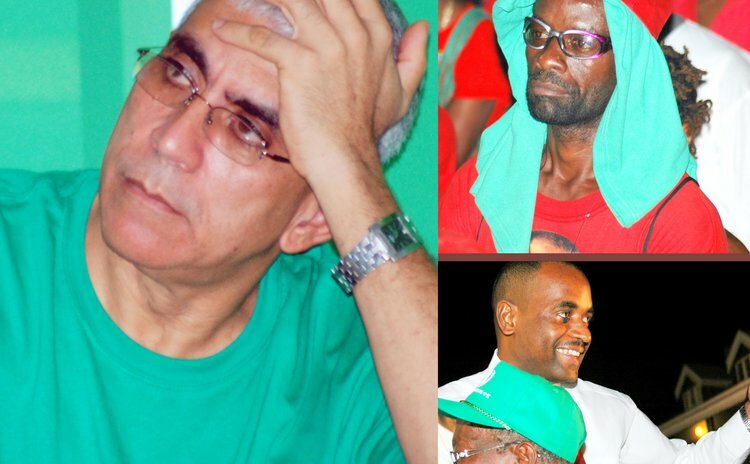 Many of its influential members saw Skerrit as a future leader, and some of them have never forgiven him for "betraying" the party and pursuing his ambitions through the DLP instead. Meantime, in a bid to help oust the UWP in 2000, the DFP hierarchy encouraged their supporters to vote the DLP, led at the time by Rosie Douglas. This support has grown immensely since Skerrit took over the DLP leadership in 2004 following the sudden passing of Prime Minister Pierre Charles. Today, the DLP enjoys no more than about two per cent support among Dominicans, consistent with the level of support which third parties in the Caribbean garner. "The collapse of the Freedom Party (has been) reflected in high support for Skerrit (but) I think it has maxed out," one political observer told The Sun. With a general election due next year – but widely believed will be held this year – the DFP must decide if it should ask its remaining members and supporters to vote UWP of DLP. Party executives are saying they don't have to choose either option. "We don't intend to tell our supporters to vote for anybody except the Freedom Party," executive member Swanston Carbon told The Sun. "The Freedom Party does not intend to play shadow to any party." Despite having been knocked into near oblivion, Carbon suggested that when the bell tolls, the DLP could very well be shocked to find the Freedom Party bloodied and bruised but still standing. In fact, he said, the party is currently considering contesting several seats. "We have a few people who want to run," he revealed, citing interest in the Cottage, Laplaine, Roseau Central, Roseau North and Soufriere seats among others. "So it's something we're considering but no (firm) decision has been made." Plus, there's another reality the DFP must face, Carbon said. "Freedom Party supporters will not vote for UWP even if we tell them. They are more inclined to vote for Labour Party. So it's better sometimes, if we think we can help UWP, to contest a seat," Carbon said, stressing that the UWP would not have won Roseau Central in the last election had the DFP not contested it. Still, openly recommending the UWP which it has never trusted, poses some sort of dilemma for the DFP leadership. This is why the interim leader, Michael Astaphan, despite leading a barrage of criticism of Skerrit, seemed hesitant to embrace the obvious alternative. "The Freedom Party has always put its support behind Dominica, you know," he told The Sun, adding that the UWP was not addressing issues of importance to the DFP; issues like a Freedom of Information Act and a Whistleblower Act. "I am very concerned that Freedomites are supporting either UWP or Labour Party," Astaphan told The Sun. "I don't trust the United Workers Party or the Dominica Labour Party. I want to hear the message of good governance. If I don't hear this I can't trust the message. We don't want to push the UWP message because they are making promises they cannot keep." Therefore, he said, the DFP will advise its members and supporters to vote for good governance. But, one political observer told The Sun it would not matter who the DFP advised its members to support since most of them are already behind Skerrit. In any event, said this observer who requested anonymity because of the sensitivity of the issue, the DLP has become the natural home for Freedomites. "They have given Labour a prime minister, they have given Labour a president, so the natural place for them to be is Labour." They have also given the DLP the man who they once saw as their saviour and, as a result, the DFP is still awaiting a resurrection.